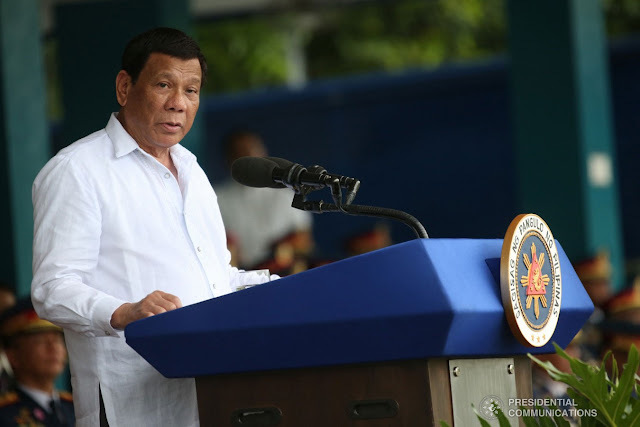 President Rodrigo Roa Duterte on Wednesday, August 8, promised a P25-million support for the Philippine National Police (PNP), aiming to cushion the financial burden of medical expenses. “I am giving you P25 million for medicines and all,” the President said in his speech during the 117th Police Service Anniversary celebration held at Camp Crame, Quezon City. “It will take care of your expenses. If put to good use, it is enough. You can always choose. I will pay. You go to St. Luke’s…Cardinal Santos,” he added. In his welcome remarks, PNP Chief Director General Oscar Albayalde expressed the PNP’s “deep gratitude” to President Duterte for his pledge of P25-million monthly support to the PNP’s Reimbursement of Hospitalization Expenses Program. The President stressed his administration’s commitment to promote the welfare of the uniformed personnel and their families. “I will likewise assure you that you will do your best and our best to promote the welfare of uniformed personnel and that of your families,” he said. “Since you put your lives on the line to serve our country and people, it is only just and fair — just fair that the government takes care of you as well,” the President further said. At the same time, the Chief Executive vowed that his administration is fully committed to enhance PNP’s capabilities. “In fact, we have allotted more than P2 billion for the PNP Capability Enhancement Plan,” he noted. President Duterte noted that Wednesday’s occasion is a celebration of PNP’s success in cleansing the organization from scalawags, who hamper the PNP’s efficiency in performing its mandate to enforce the law and serve the people. PNP’s performance in the past two years manifests its efforts in instituting reforms from within its ranks, the President said. He cited the tireless dedication of the police personnel, noting that almost 160,000 illegal drug personalities have been apprehended in the past two years. Duterte also mentioned that more than 6,000 administrative cases were resolved as part of the efforts to cleanse their ranks. In addition, the PNP has also achieved a total crime solution efficiency rate of 72.13 percent. “Kaya ako sumasaludo sa inyo kasi bilib talaga ako sa inyo,” he said. Meanwhile, President Duterte reiterated that he hates gambling. “Yesterday I fired the council of Nayong Pilipino, all of them. You do not give gambling licenses or franchise for 75 years. Mean to say that a child is born today and 75 years later, he is that old. There will still be gambling in the city,” he said. “I will not allow it. I hate gambling. I do not want it. There will be no casinos outside of what are existing here. I am not granting anything. Basta gambling, ayaw ko. Better look for something more enticing,” the President added. After gracing the Police Service anniversary, the President visited two wounded police officers recuperating at the PNP General Hospital. He awarded the Order of Lapu-Lapu Kampilan Medal to Police Senior Insp. Aiko Rapas Tesoro, who was wounded during a hot pursuit operation in Zamboanga del Sur in May this year and PO1 Ringy Boy Dacut Tomale, who was injured in an ambush in Western Samar last month.